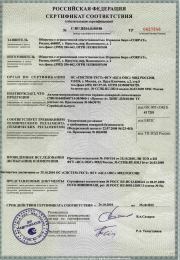 A TR Certificate is an official confirmation that the products conform to the national Russian technical regulations. The main purpose of the technical regulations is to protect the health and safety of consumers. According to the reform of the technical regulation implemented in Russia, technical regulations should replace the old system of the GOST certification or GOST declaration, which no longer meets the modern requirements, and considerably simplify the certification process. With the entry into force of the new technical regulations old GOST standards were overridden. Products exported to Russia and subject to compulsory certification are TR certified and marked with a TR mark to allow the Russian border to pass. The TR certificate of conformity may only be issued by a notified body after the quality inspection of the products. "Federal Law “Оn technical regulation"
As a consequence of the harmonization of national safety standards between Russia, Belarus and Kazakhstan, the previous national technical regulations such as Russian GOST and TR certification were gradually expired and substituted by the new technical regulations of the EAEU (TR EAEU) in every industrial sector. In addition to the EAC certification, the EAC declarartion has also been introduced in the Customs Union as a simpler and more favorable form of proof of conformity. The TR compulsory certification for Export to Russia is subject to all products covered by the government regulation of 1 December 2009 № 982. The complete list of current technical regulations of the Russian Federation. Declaration of conformity with technical regulations is a compulsory procedure for the confirmation of product quality. The complete list of goods requiring a TR Declaration for import into Russia can be found in the Government Directive № 982. In contrast to TR certification, a TR Declaration can only be applied for by the importer of the goods. The application procedure for a TR declaration shows only slight differences in the TR Certification process in Russia. TR Declaration usually has to be applied only for consumer goods such as food, clothing and adult shoes, furniture and various hand tools. From 1 July 2010, the Customs Code of the Customs Union between Russia, Belarus and Kazakhstan entered into force. The new Customs Code is intended to replace existing national certification requirements such as Russian GOST-R, TR or Kazakh GOST-K standards by the uniform technical regulations and technical guidelines of the Customs Union by 2015. TR Certificate is issued by the Russian notified body at the request of the applicant. The products certified according to the technical regulations of the Russian Federation, for which a TR certificate has been issued, must bear the TR mark in order to demonstrate conformity with all legal requirements of the Russian Federation. The requirements for a mandatory TR certification are covered by the government directive No. 696 of 19 November 2003. The terms and the costs associated with a certificate application, depend on several different factors, such as the classification of product, any required laboratory checks and complexity of all examinations. As such the exact conditions of the certification are always determined individually based on the required documentation. Please note that an application for a certificate can take from a few days, to a few weeks to process. If you order an TR certificate, you will receive a copy of it via email immediately upon our successful certification process. Alongside the original document and two certified copies of it by post, within a few days’ time of this. Our highest priority is not only to deliver an individually tailored service to every client, but also in offering an impeccable level of transparency to the high standard of our qualified service. Offer: TR certificate for serial production with a validity of up to 5 years from 500 €! Request an offer for TR certification! Please call us or send us an email. We will provide you with a free, non-binding quote and will be glad to answer all your questions about TR certification. Convince yourself of the quality of our services!